The first U.S. edition of PhotoFairs will be held Jan. 27-29 at Fort Mason's Festival Pavilion. The fair includes 34 national and international galleries, representing 14 countries and 22 cities worldwide with an array of special events. 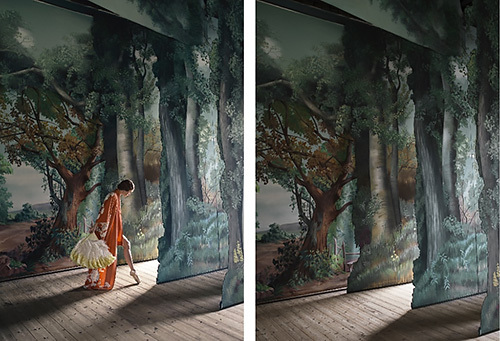 Anja Niemi. 'The Stage,' courtesy of The Little Black Gallery (London). The fair presents international artists never before seen in the Bay Area, including the debut of new work by Cortis & Sonderegger, Ahmet Ertug, Martin Kollar, Anja Niemi, Eric Pillot, Wang Ningde, Jordan Sullivan, Ester Vonplon and Tyler Udall. PhotoFairs will also celebrate significant photographic talents from the United States' West Coast, highlighting such artists as John Chiara, Jim Campbell, Paul Fusco, Mona Kuhn and SFMOMA's prestigious SECA award winner Sean McFarland. The PhotoFairs public program includes installations, panels, artist talks, book signings and exhibitions, providing visitors with opportunities to learn more about the photographic medium. Throughout the fair and the series of featured public programs, the role of the artist will also be emphasized to give visitors the opportunity to further engage with featured artists, as well as eminent curators from institutions. The fair's public programs are anchored by Insights: New Approaches to Photography since 2000, an exhibition offering unique (non-editioned) works for private sale, curated by Alexander Montague-Sparey, Artistic Director, PhotoFairs and Allie Haeusslein, Associate Director, Pier 24 Photography, San Francisco. The exhibition focuses entirely on cutting-edge artists using photography to push the boundaries of the medium. Artists include John Chiara, Susan Derges, Christine Elfman, Sissi Farassat, Chris McCaw, Sean McFarland, Klea McKenna, Anja Niemi, Jacqueline Nordheim, Nando Alvarez Perez, Meghann Riepenhoff, Ester Vonplon, Shao Wenhuan and Noah Wilson. For more information, visit the Web site. Artist Talks with Jim Campbell, Paul Graham, Alejandro Guijarro, Mona Kuhn and Wang Ningde. Panel Discussions with industry experts Jason Eppink (Curator of Digital Media, Museum of the Moving Image), Virginia Heckert (Curator and Department Head, Photographs, J. Paul Getty Museum), Zachary Kaplan (Executive Director, Rhizome, New Museum), Michael Xufu Huang (Co-Founder, M WOODS Museum), Erin O'Toole (Curator, SFMOMA) and Tiffany Zabludowicz (Collector and Curator). Book Signings with artists John Chiara, Jungjin Lee, Chris McCaw, Sean McFarland, Anja Niemi, Phenomena, Meghann Riepenhoff and Jordan Sullivan. Entry to all Conversations events and book signings is included in the ticket price. For the complete schedule, visit the Web site. SAN FRANCISCO -- PhotoFairs is proud to present its inaugural U.S. edition in San Francisco, opening to the public from Jan. 27-29 at Fort Mason's Festival Pavilion. Complementing the Bay Area's strong photographic legacy, PhotoFairs San Francisco features a selection of 34 national and international galleries, representing 14 countries and 22 cities worldwide, showcasing today's most significant artists across its exhibiting sectors and public program. Drawing on the international reach from the majority of the participating galleries who have exhibition spaces outside of the United States, the curated environment will bring together blue-chip vintage material alongside contemporary photographic works of art. New and seasoned collectors alike will experience a breadth of editioned and unique photography that will be emphasized across many of the fair's public programs and platforms. PhotoFairs San Francisco is the prime West Coast destination for discovering and collecting fine art photography. The fair will focus on presenting international artists never before seen in the Bay Area and will see the debut of new work by artists including Cortis & Sonderegger, Ahmet Ertug, Martin Kollar, Anja Niemi, Eric Pillot, Wang Ningde, Jordan Sullivan, Ester Vonplon and Tyler Udall. PhotoFairs will also celebrate significant photographic talents from the United States' West Coast, highlighting such artists as John Chiara, Jim Campbell, Paul Fusco, Mona Kuhn and SFMOMA's prestigious SECA award winner Sean McFarland. The participating galleries will be located in two sectors, Main and Platform. The Main sector draws together ambitious presentations from national and international galleries featuring emerging and established artists from around the world. The Platform sector presents galleries participating in their first United States-based art fair offering a true site of discovery. Highlighted works by European artists include, Martin Kollar (Galerie & Edition Stephan Witschi, Zurich); Tina Berning & Michelangelo di Baptista, Peter Lindbergh and Anderson & Low (Camera Work, Berlin); Yves Marchand & Romain Meffre and Alejandro Guijarro (Tristan Hoare, London); Eric Pillot and Willy Rizzo (Galerie Dumonteil, Paris, Shanghai & New York); Denis Darzacq (De Soto Gallery, Venice Beach); Vale rie Belin (Edwynn Houk Gallery, New York & Zurich); and Charlotte Dumas (andriesse eyck galerie, Amsterdam). From Asia and the Middle East, celebrated Japanese artists Sohei Nishino (Bryce Wolkowitz Gallery, New York), Yuki Onodera and Aki Lumi (Vanguard Gallery, Shanghai) and Osamu Yokonami (De Soto Gallery, Venice Beach) will be presented, along with South Korean and Chinese photographers Boomoon and Shen Wei (Flowers Gallery, London & New York); Birdhead and Jungjin Lee (Galerie & Edition Stephan Witschi, Zurich); RongRong & Inri and Yang Fudong (Three Shadows +3 Gallery, Beijing & Xiamen). Middle Eastern-based artists include Shariar Tavakoli, Mehdi Abdolkarimi and Mehrdad Afsari (Mohsen Gallery, Tehran). Latin American artists at the fair are Vik Muniz and Abelardo Morell (Edwynn Houk Gallery, New York & Zurich), alongside a special solo presentation of Rodrigo Valenzuela's moving and still image work (Upfor, Portland / Klowden Mann, Los Angeles). Key talent from the West Coast and across the United States includes Paul Fusco (Danziger Gallery, New York), Ryan McGinley (Ratio 3, San Francisco), Jim Campbell (Bryce Wolkowitz Gallery, New York), Jeff Brouws (Robert Koch Gallery, San Francisco), Todd Hido (Casemore Kirkeby, San Francisco), Tabitha Soren and McNair Evans (EUQINOMprojects, San Francisco), Randy Hayes (Themes+Projects, San Francisco) along with Mona Kuhn (EUQINOMprojects, San Francisco and Flowers Gallery, London & New York) and many more. Emerging artist Kate Stone will be shown by Rubber Factory (New York), while East Wing (Dubai) will present the U.S. debut of Swiss-based artists Cortis & Sonderegger. A solo presentation of the large-scale work of Ahmet Ertug will be shown by ELIPSIS PROJECTS (London & Istanbul) and Pan-View (Zhengzhou) will present a group exhibition specifically looking at China's social environment and ideological status. PhotoFairs' public programs are anchored by Insights: New Approaches to Photography since 2000, an exhibition offering unique (non-editioned) works for private sale, curated by Alexander Montague-Sparey, Artistic Director, PhotoFairs and Allie Haeusslein, Associate Director, Pier 24 Photography, San Francisco. Entry to all Conversations events and book signings is included in the ticket price. For the complete schedule go to http://www.PhotoFairs.org/sanfrancisco/public-program/conversations. The West Coast premier of Fragments by in-demand London collective Random International (Pace Art + Technology, Palo Alto) features almost 200 identical, small mirrors which, despite their flat and static appearance, collectively turn to face an approaching onlooker. Los Angeles-based artist and writer Jordan Sullivan (Rubber Factory, New York), will debut his latest work Night Finds You. Sullivan's ethereal landscapes printed on translucent silk fabrics will be hung from the ceiling and appear free-floating, giving them a sculptural and ghostly appearance. A special installation of Scott McFarland's (CHOI&LAGER Gallery, Cologne & Seoul and Division Gallery (Montreal & Toronto) large scale video work Shattered Glass, Sunny with cloudy periods, 2016 is a trans-mounted chromogenic print in a lightbox juxtaposed alongside a 4K video piece -- both captured simultaneously using a digital camera. Phenomena, a site-specific installation and publication by Copenhagen-based artist collective Sara Galbiati, Peter Helles Eriksen and Tobias Selneas Markussen, shown by East Wing (Dubai). Running throughout the fair, the installation is a result of the collective's investigation into what lies behind different accounts of UFOs and extra terrestrial beings. LEAP Screen: What You See is Not What you See, curated by LEAP, China's leading contemporary art magazine, will showcase the work of thirteen exciting Chinese artists working with moving-image including: Cao Fei, Cheng Ran, Jiang Zhi, Wang Tuo and Zheng Le. Arts Partner XITEK will present the U.S. premier of No Name, the latest work by Wang Ningde one of China's most exciting contemporary photographers. The artist photographs brushstroke markings left by nameless people in urban spaces to create photographic artworks that are reminiscent of paintings in their appearance. PhotoFairs is pleased to welcome the support and participation of the following sponsors and cultural partners: Wine Partner Banshee Wines, VIP Furniture Partner Birch + Tailor, Private Jet Partner Surf Air and Art Partner XITEK. Additional partners included Minnesota Street Project Art Services, Smith Andersen North, DECASO, Four Barrel and restaurant Stones Throw. Additional thanks to Audi on demand, Belvoir Fruit Farms, HEROSHOP, Lyft, Saint-Geron, SELECT and The Leica Store San Francisco Gallery. The fair's Cultural Partners include: Aperture; Asian Art Museum; Berkeley Art Museum and Pacific Film Archive; Chinese Cultural Center of San Francisco; CCA Wattis Institute for Contemporary Arts; Contemporary Jewish Museum; di Rosa; Filter Photo; Fine Arts Museums of San Francisco -- de Young & Legion of Honor; Houston Center for Photography; Museum of the African Diaspora; Museum of Contemporary Photography, Chicago; Photographic Center Northwest; Private Collections; RayKo Photo Center; Root Division; SF Camerawork; San Francisco Art Dealers Association; San Francisco Art Institute; San Jose Museum of Art; SOMArts, UCR ARTS block and Yerba Buena Center for the Arts. Media Partners of the fair include: 7x7.com, Aesthetica, artprice.com, ArtReview, ArtReview Asia, KQED Public Broadcasting, Mutual Art, Modern Luxury -- San Francisco Magazine and Silicon Valley Magazine, Musee Magazine, Ran Dian, San Francisco Arts Quarterly, So It Goes and Whitewall. The official Online Partner of the fair is Artsy. An online preview of all the work for sale is available at Artsy.net and on the Artsy app for iPhone & iPad.